Belgium came to Cooperstown and we were there to witness it. Special thanks to Jack Curtin for giving us the heads-up back in early spring that tickets were about to become available. And, also to Larry Bennett of Ommegang for helping us through some on-line ticket ordering difficulties. I've heard of "work-arounds", but sheesh Larry walked me through a workaround to make the Shopping Cart thingy work like I've never seen before. We made it there and so did many hundred other better beer enthusiasts. Our trip began early Friday morning in the rented RV. Our plan was to get to Ommegang with enough time to visit the Baseball Hall of Fame in the quaint village of Cooperstown before joining in the evening dinner that Ommegang had planned. We arrived at the brewery's property shortly before 3pm, but decided instead to setup camp, relax, and socialize with the several friends we immediately ran into. Greg (from Paoli, and soon from Luxembourg, as he'll soon be called), Greg (from Exton, as he's always been called), Patrick (of Suburban Tom Peters fame), and Ric (brewer extraordinaire) became quick neighbors. Before we knew it, we were setting up camp, drinking some brews, and calling off the HOF trip until the following day. If you've never been to Ommegang's BCTC event, you need to start by understanding that it's so much more than a beer-tasting festival. A four hour festival is just a small part of what this weekend event is all about. Are there things that could improve? Sure...is anything ever "perfect?" But, all the good parts add up to create an aura that not even torrential rain (last year) could dampen. On top of that, the event's organizers took a wise path this year to ensuring longer-term viability of this event. They restricted ticket sales on Friday to 200 campers and an advertised 800 ticketholders for Saturday's tasting event. How close they came to those numbers is anyone's guess. What I'm saying is that there's no doubt they definitely made those numbers, just how far over is the question. But, with their property size and the layout of the event (eating, music, drinking, horses, falcons, camping, etc. ), it was way more than comfortable being a part of this event. Funny thing is, I didn't think last year was all that bad. More jerks, yes, but not uncomfortably overcrowded. 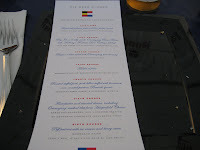 After surviving gusty winds and occasional drizzle on Friday afternoon, we settled into the dinner under the big tent. Long tables of place settings were setup for us to sit wherever we pleased. Here's where the story gets good. On each 8-foot table was a bin of Ommegang liquid swag. When you hear me say that I felt the $120 was a bargain, allow me to make observation number one. The bins were filled with Witte, Rare Vos, Amber, Grand Cru, Duvel, Maredsous 10, and Three Philosophers. And, let's just say there was way more than enough for everyone at the table. Add to that the complimentary bottle of Ommegeddon for each attendee (complete with Ommegeddon glassware) and you know that they weren't going to let us go thirsty on this weekend. The dinner, ah yes the dinner. This was real food, folks. Here's one area that I think the brewery may have reached a bit too far. In changing up the format this year and going for a Friday night six-course dinner (seven if you count the appetizer course) and seeming to be short staffed, the dinner seemed to draw out interminably. This wasn't bad for all of us, though a few of our party did finally have enough and retreated to the campsite. For those of us that stuck around to the end, there was the treat of Ommegang's new stout and kriek beers that accompanied the last two courses. While they weren't nearly my favorites of the weekend, it was nice to see a couple of new styles from this Randy and crew at the brewery. I wasn't keeping track of time, but I too was starting to feel the long day weigh down upon me. Needless to say, I believe the organizers recognized this, will learn from it, and if they do it next year either cut back on the number or courses or beef up on the service aspect. But, the few waitstaff that were there were certainly busting their butts. Thanks, for sure! Click here for recap of more fun from Day 2 of Ommegang's BCTC 2007 event. I want to go back! Next year I am going to have to bring some Starbucks or (bleh)Red Bull so I can stay awake past 11pm. I missed out on the Ommegang Kriek. I think I missed out on much of Saturday! Wow! I gotta get to one of these things! Thanks for sharing the pics, etc. Dinner did seem interminable, but I'm so glad I stayed until the bitter end since the dessert was so good, especially with the Ommegang Kriek. Yum.